Even if you’re not on a perfume quest, no visit to Florence is complete without popping into this gilded, mosaic-floored temple to fragrance. (See it in our main photo, too.) 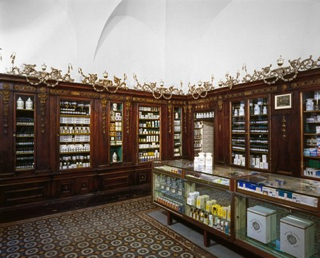 Dominican monks opened a pharmacy to the public here in 1612; there’s still a beautiful grey-painted working pharmacy here. 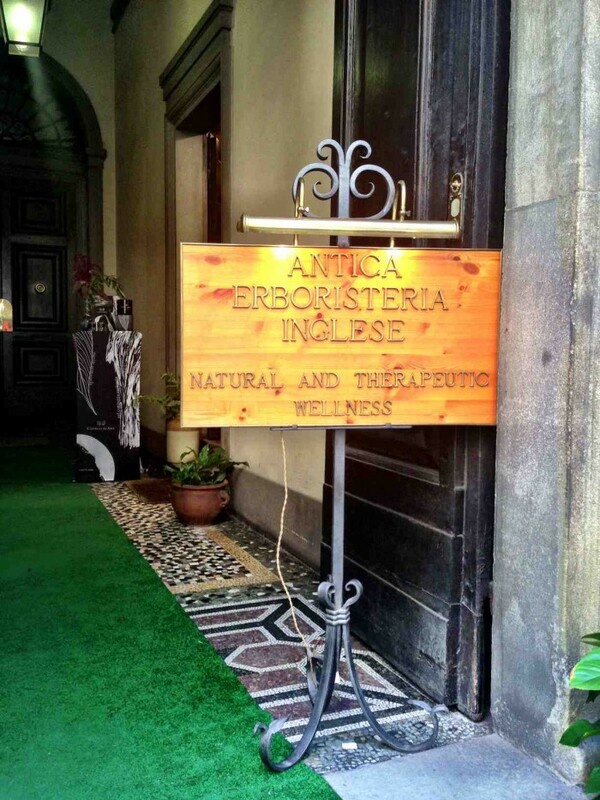 So: you can buy the ‘patented’ herbal remedies – balms, lotions, tonics, tisanes, honeys – alongside more modern creations, including haircare, skincare and Santa Maria Novella’s beautifully-bottled and packaged range of perfumes. 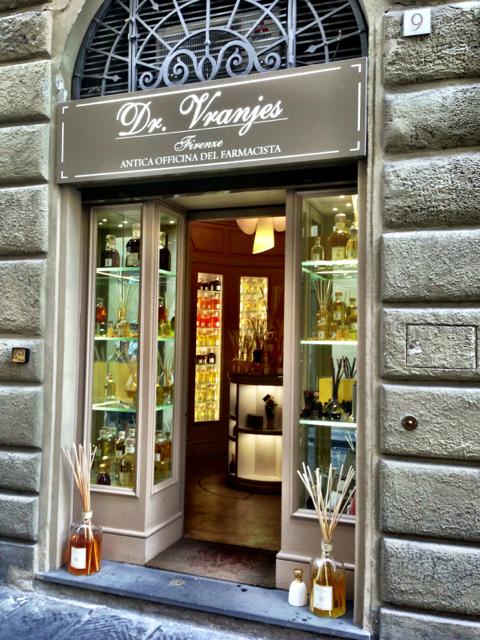 Dr. Vranjes is especially big on ‘bastoncini’ (scent sticks), with fragrances like fig and sage, lime and ginger, pomegranate and mint, rose petal, tuberose and lily and more. A bestseller is the warm and wonderful amber scent (and we’re not surprised). 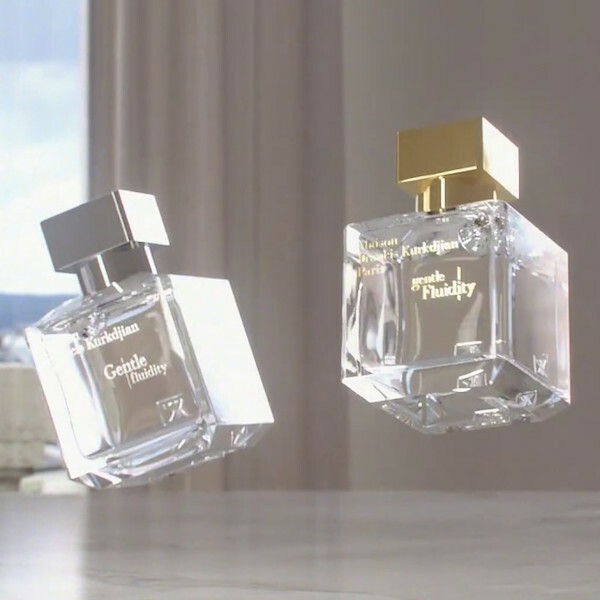 There arealcohol-free car perfumes, too, designed to go with the leather, wood and textiles of car interiors – and they sure beat those dangly little Christmas trees. 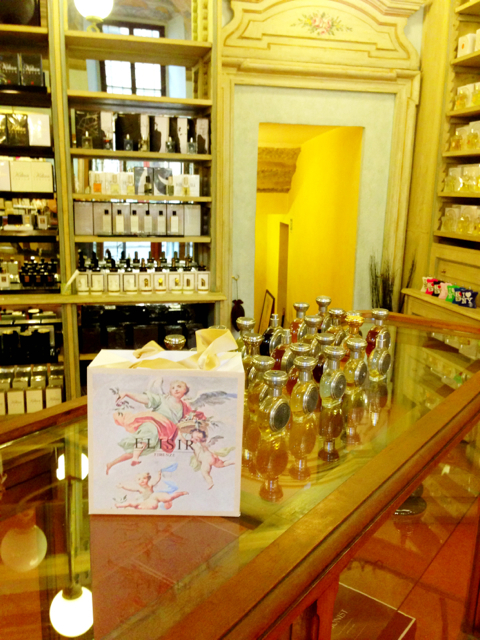 Right, slap bang on Florence’s spiffiest shopping street (the equivalent of Bond Street or Rodeo Drive) is ‘The English Pharmacy’, which somehow combines the holistic and medical side of a pharmacy with a fine fragrance destination. 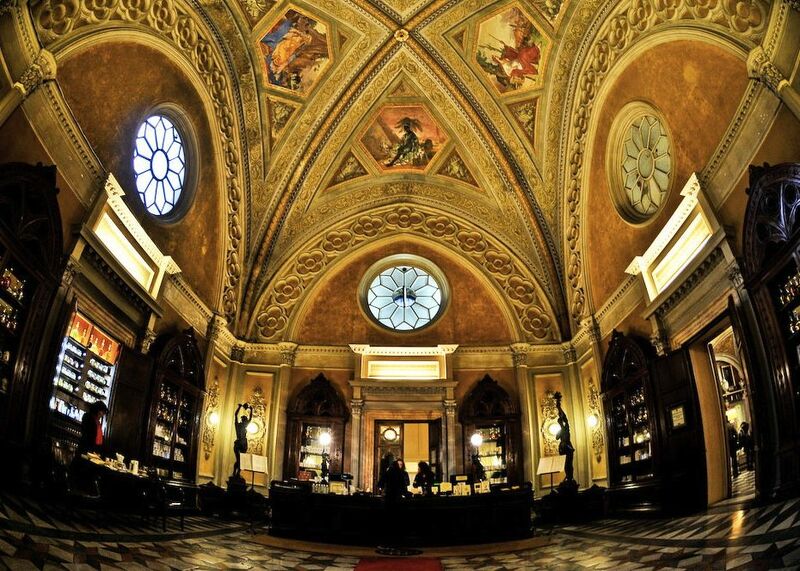 It’s a beautiful old building (like so many of Florence’s perfume stores), with a vaulted ceiling, limestone fireplace, tapestry chairs: all a bit higgledy-piggledy but charming with it. And alongside home-made lavender products (using lavender grown on the owner’s Mazzei vineyard, in Chianti), you’ll find an extraordinary collection of fragrances from Frederic Malle, Penhaligon’s, Floris, Serge Lutens and Terry de Gunzburg, along with pricy-but-gorgeous candles from the Castello di Ama, another of Chianti’s renowned vineyards, infused with unusual scents like fennel and geranium. Quirky – but the manager we met spoke perfect English and was most welcoming. 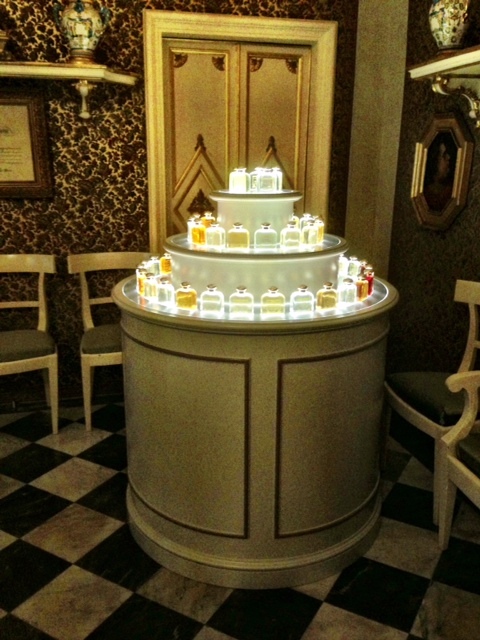 A fairly average, Continental-style perfumery on the outside – but a pretty spectacular range within. 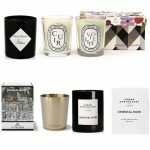 If you live somewhere blessed by a large department store this might not have you hyperventilating, but it’s still extraordinary to us to find Annick Goutal, Robert Piguet, Comme des Garçons, Comptoire Sud Pacifique, Tom Ford, Houbigant, Monte Carlo’s Perris fragrances, Serge Lutens, Etro, Acqua di Parma and more in one spot. 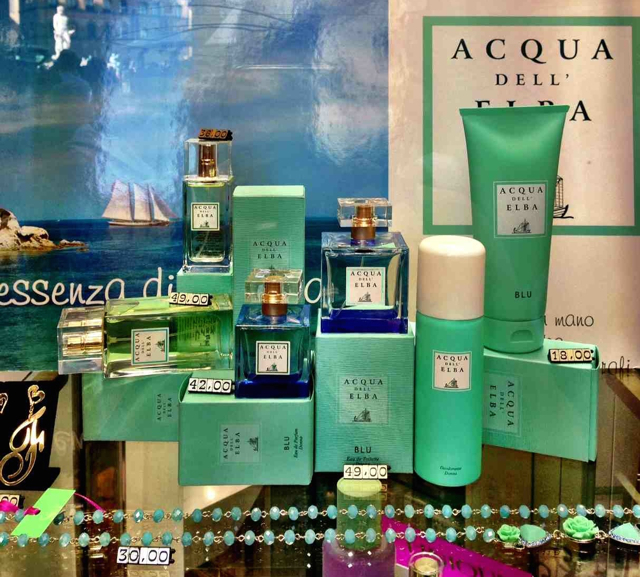 Check out the lovely, fresh Acqua dell’Elba, in particular: an aquatic-inspired collection of fragrances from the island of Elba – the first place we’ve seen these eminently splashable creations on sale. Right next door to Aline, another decidedly quirky perfume destination. Allegedly, Florentine perfumer Dr. Giovanni di Massimo stumbled upon Catherine de Medici’s ‘secret perfume recipes’ in a treasure trove of Medici fragrance formulas, back in 1966, after the famous Florentine flood, while sorting through the soggy mess in his basement. (The Medici Palace was just across the square.) 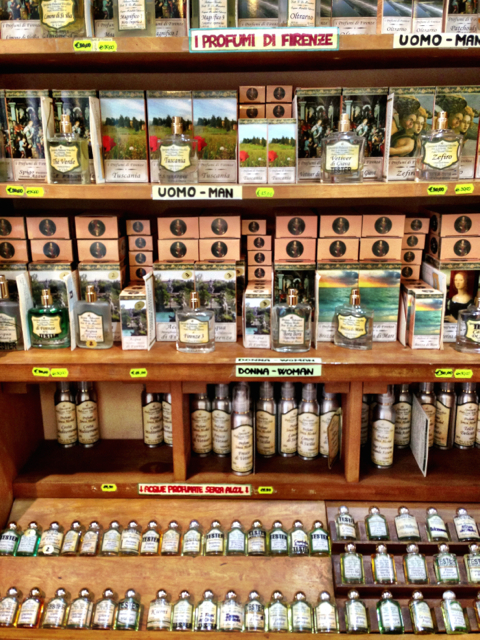 I Profumi di Firenzi is also (allegedly) all-natural, and there are almost 30 scents to try. 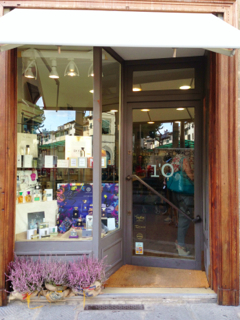 It’s far from the most glamorous fragrance-shopping destination in Florence (they’re definitely Magic Marker-mad – see left), but the fragrances aren’t luxe-priced at all so we’ll definitely forgive them that. Fab bath salts, too. (Hard to resist buying Catherine de Medici’s bath salts, we find, for a queenly bathing experience – with hints of lily or the valley and iris, if you’re interested. Sniffing the bath salts themselves gives nothing away.) Can we make a little recommendation, when you leave the perfumery? Turn right into the big square and treat yourself to a chocolate ice cream and/or a hot chocolate at Rivoire (just on the left), one of our favourite Florence pit-stop, offering spectacular people-watching. 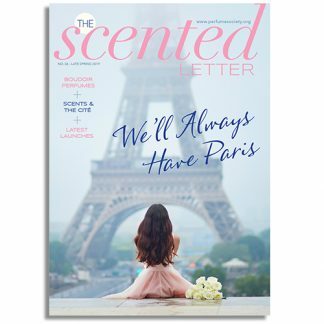 This doesn’t have the historic setting of Avery– which is a bit like shopping in a temple, or a chapel – but it has one of the most extraordinary comprehensive fragrance offerings we’ve ever stumbled upon. On our visit, we got chatting with a man from Leeds who’d come all the way from Yorkshire to check this perfumery out (bizarrely, missing his own 40th birthday party, but there you go) – and really, we’re not surprised. The brands stocked in the three rooms are essentially a roll-call of some of the most interesting names in contemporary perfumery: Heeley, Jovoy Paris, Keiko Mecheri, Olfactive Studio, Jardins d’Écrivains, Creed, Clive Christian, Amouage, Andy Tayer. 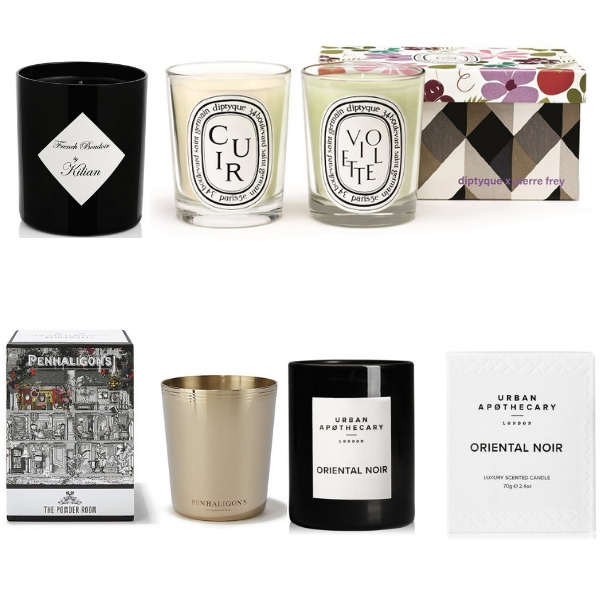 There’s a ginormous selection of scented candles (we bought several from the Italian brand Tiziana Terenzi – a new favourite is XIX March, designed to capture the scent of the night air on 18th March each year when tradition demands that a bonfire be built to burn up the winter twigs and brush, making room for the rebirth of spring). 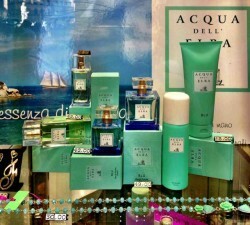 They’ve their own range of home fragrances at L’O Profumo, too. 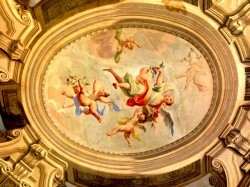 Somewhat off the beaten track, it’s absolutely worth the walk. 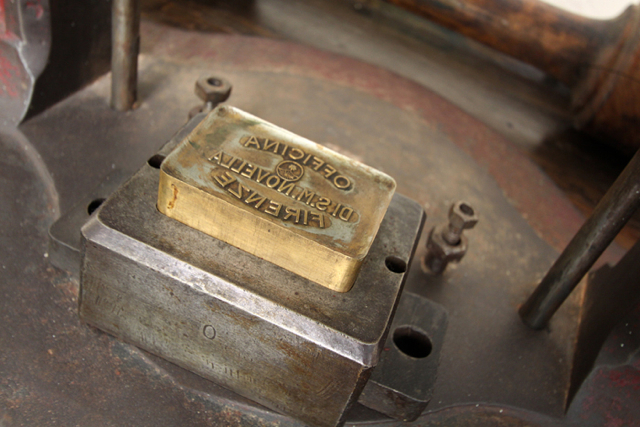 Turns out – who knew? – that this wonderful (smaller) pharmacy has been in business even longer than the legendary Santa Maria Novella – since 1561, in fact (as the name trumpets). 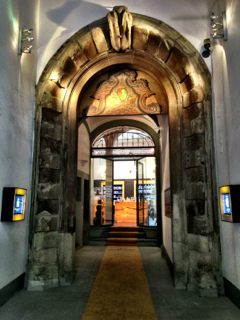 The building itself dates back to 1400. Exquisite wooden cabinets garlanded with gilt display the range of medicinal preparations (now made using up-to-date materials and techniques, rather than the good old pestle and mortar), the soaps, the bodycare – and the fragrances themselves. There were 20 different scents, when we visited (some available as after-shaves, as well as colognes). Discover snuggly-soft Regina: rice powder, iris, rose, or (for patchouli nuts), Patchouly Indonesiano, which in its pyramid lists top notes: pathchouli, middle notes: patchouli, base notes: patchouli. PS There’s one more we didn’t get to visit this time: Profumeria Antonella. It was slightly ‘off the manor’, but is said to have Montale, Juliette Has a Gun, État Libre d’Orange, Maitre Parfumeur et Gantier, Serge Lutens and Lalique. If you’re staying to the north-west of the centre, it’s at Piazza Dalmazia, Firenze 50141 (telephone +39 055 436 0971). Next time, we promise.